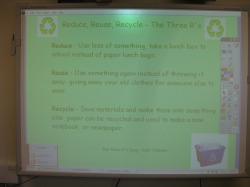 I began my Three R's unit with an introduction to each of the three R's: Reduce, Reuse, Recycle. I read 10 Things I Can Do to Help My World by Melanie Walsh. Next, I led students through a Promethean Board Flipchart I created on the Three R's. I began with simple definitions and an example of each, returning to examples given in the book, 10 Things. After this brief introduction, I played a YouTube video of Jack Johnson's song, The 3 R's, and allowed the students to chime in. As a group, we examined Jack Johnson's examples for each of the the Three R's. Following, I introduced a Venn diagram with the subtitles: Reduce, Reuse, and Recycle. 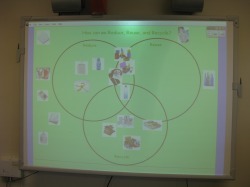 Familiar objects were placed around the diagram, and I invited students to approach the board and interactively move the objects to which R they related to best. I used this activity as an informal assessment of their knowledge of Reduce, Reuse, Recycle after this preliminary exposure. - What are each of the three R's (Reduce, Reuse, Recycle), and what do they look like in practice? · SWBAT comfortably participate throughout the entirety of the lesson. · SWBAT demonstrate a developing understanding of at least one of the three R's. Students have participated in informal audio interviews about recycling, its importance, and what it entails. Based on these interviews, students have demonstrated a minimal, or vague understanding of recycling, and its important impact on our environment. I'll begin the lesson with the book 10 Things I Can Do To Help My World by Melanie Walsh. The book features simple things that children can do to help save energy and resources: turn off the lights when you leave the room, bike or walk instead of driving, turn of the water while brushing teeth, throw away trash, use both sides of the paper, use recycled materials to make toys, recycle glass/plastic/paper, unplug the TV and other electronics, creating feeders for the birds, planting seeds, etc. After reading, students will Pair & Share and discuss one of the 'things' they either A) already do at home or at school or B) think they could try at home or at school. 1) Following this introductory activity, I will turn on the Promethean board, which will display the Reduce, Reuse, Recycle flipchart I've created. 2) The first slide of the flipchart lists the three R's and defines them in simple terms. This visual is for my own reference when describing the three R's, but I will also read these to the students using a pointer. 3) After briefly describing each of the three R's and providing examples for each, I'll play Jack Johnson's 'The Three R's' song, using a link to a YouTube video intended for children. 4) Students will listen to the song once, and then I'll direct their attention to the examples Mr. Johnson provides for each of the three R's. As a class, we'll listen to the song a second time, pausing the video to share and discuss. 5) Following this activity, I'll turn the flipchart to the next slide, which is a Venn diagram with the subtitles: Reduce, Reuse, Recycle. Students are familiar with this type of chart, and have sorted items accordingly. 6) Surrounding the diagram are enough items for each student to move one object, and extras for modeling purposes. These items range from cloth napkins, plastic water bottles, clothes, plastic grocery bags, reusable lunch boxes, newspaper, glass bottles, etc. I'll point out and name each of these items, and then model the placement of a familiar item, specifically one mentioned in Mr. Johnson's song – Clothes, try on your older sibling's clothes and reuse. I'll demonstrate how to use the Promethean board pen to slide the clothes into the circle labeled Reuse. At this point, I will not be so concerned with the overlapping concept of clothes as Reuse as well as Reduce, as I do not want to overwhelm the students. What is important during this activity is whether students can demonstrate a developing understanding of at least one of the three R's. 7) After this modeling, each student will be called upon to interact with the board and move an item into the circle they see fit. While students complete this task, I'll ask them to articulate to the group, if possible, the reasoning for their placement of the item. 8) Once each student has placed his/her item, I will save the flipchart, in order to return to it for assessment purposes. Students will work in teams of three to evaluate a portion of the items. Groups will come together to share out their knowledge. More than half of my students are ELLs, and sometimes struggle with new vocabulary. It will be important that these students are supported with visuals, as well as clear directions and explanations. Within my lesson, I'm working to differentiate my instruction on many levels, including individual, pairs, small group, and whole group work. With Gardner's multiple intelligences in mind, I've selected some visual representations of the three R's, mathematical (data sorting), linguistic, and verbal aspects to support the learners in my classroom.